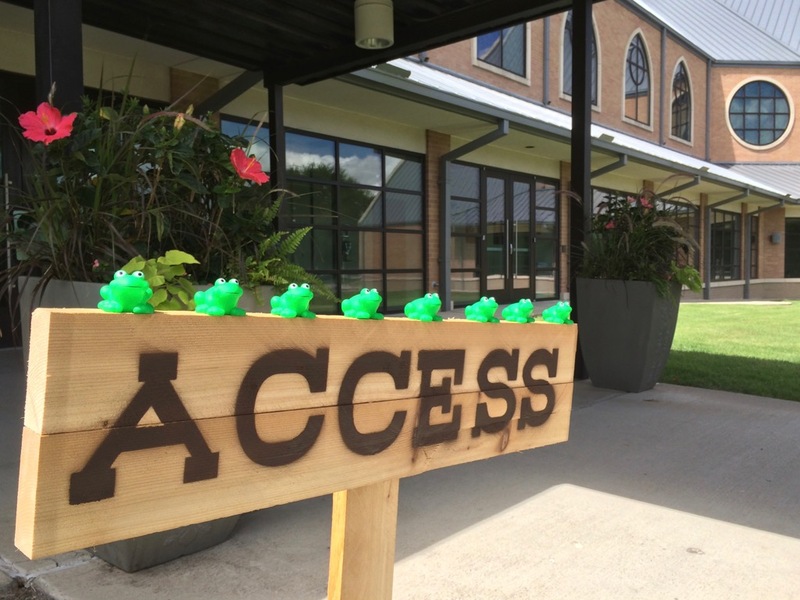 Those creatures on the Access sign are gratitoads. In 2014 our church members took photos with gratitoads to document things for which we were grateful. I recently listened to a podcast where two psychology professors reminded me that not everything that provides a reason for giving thanks is visible. The professors gave four examples of invisible but real reasons for gratitude. They named opportunities for education, being alive, freedom of speech, and the dramatic reduction in child mortality over the past hundred years. They went on to say that happiness and gratitude tend to go together, and that people that take time to think about all the visible and invisible things for which they have to be grateful tend to be happier. Thinking of people that look for reasons to give thanks reminded me of the apostle, Paul, who – while he was in jail - wrote, "Rejoice in the Lord always; again I will say, rejoice" (Philippians 4:4). I encourage you to take time over the days leading up to Easter to think about the invisible and visible reasons you have for gratitude. Give some time to recall Jesus' life, death, and resurrection and how it has changed the world and how it has affected your life. Think about our faith community that exists because of Jesus and how it makes a positive difference in your life. Finally, I ask you to invite friends to join you at one or more of the many events happening around our church in the coming days. From the Lenten Journey to the Easter Egg Hunt to special Thursday and Friday services focused on Jesus' Last Supper and crucifixion to our Easter worship services, each event will help in a unique way to make the invisible but very real things of God a bit more visible. They'll increase our gratitude and likely our happiness too. I'll see you this Sunday at Access where we'll worship God with amazing music, giving, scripture, prayer, and a sermon looking at the "Holy Ground" at the foot of the cross. We'll even invite our kids to participate in a "palm processional" that will recreate the excitement as people waved palm branches when Jesus entered Jerusalem the week before Easter.